Coburg | veganopoulous.com <-- I've moved here! Equally adorable is the delightful Mimmo. She was telling us all about converting the sweets to vegan recipes and her interest in veganism and helping animals. Unfortunately she has lost some of her regular customers since changing the recipes (boo to those people I say) but she has absolutely won me over. And she has won new vegan customers too. 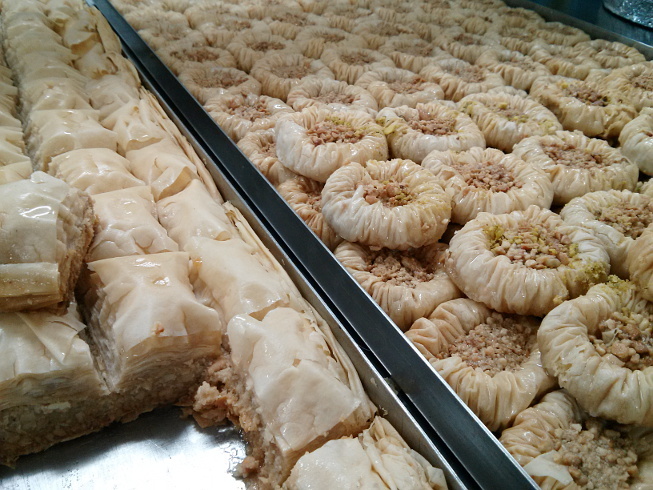 I really do encourage my Melbourne readers to head to Al Nada and talk to Mimmo. Seriously peeps, THIS is the kind of business that should be supported. Mimmo has changed family recipes and gone against some cultural expectations by taking the business in the vegan direction. As a person who grew up with cultural expectations heaped upon me, I certainly appreciate what Mimmo has done here. 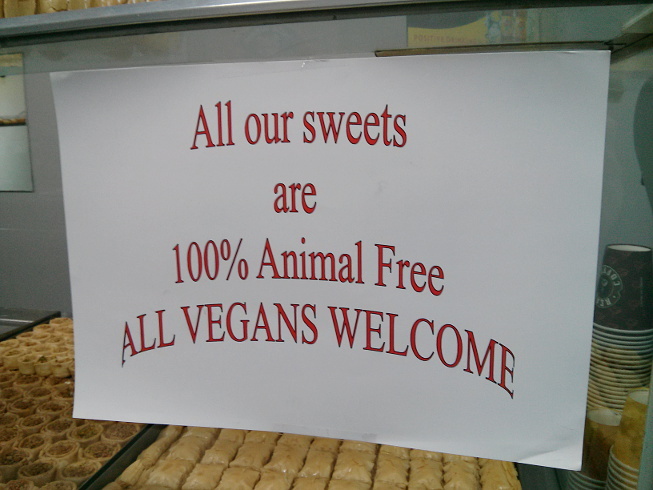 So please check out the shop 🙂 Everything baked on the premises is vegan, though the sweets (more biscuity things) brought in from outside are not vegan. 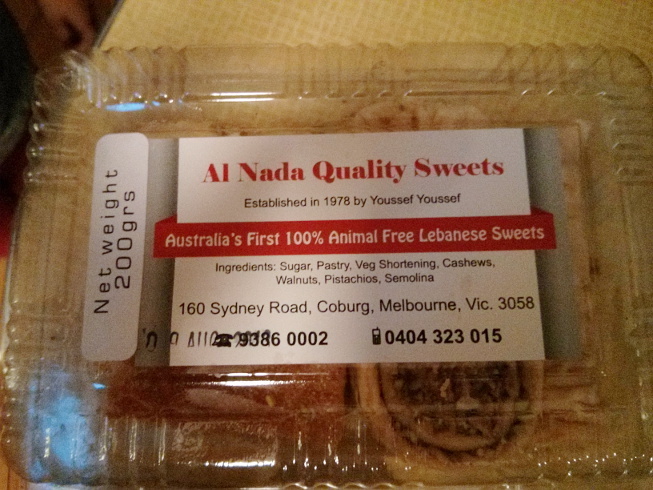 There is vegan Lebanese shortbread though! 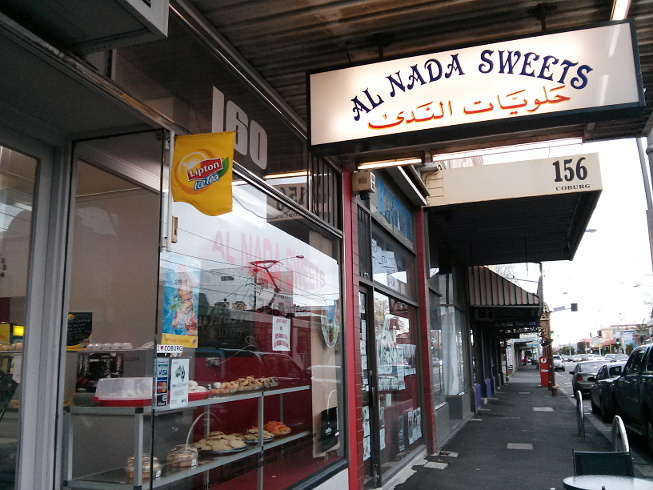 Al Nada Sweets is located at 160 Sydney Road in Coburg. There are some tables and chairs inside. And huge trays of sweets 🙂 Go go go! I am ashamed you guys. I’ve been frequenting the area around Coburg Library for about two years. And in that time I have never been to Cafe Sarabella. 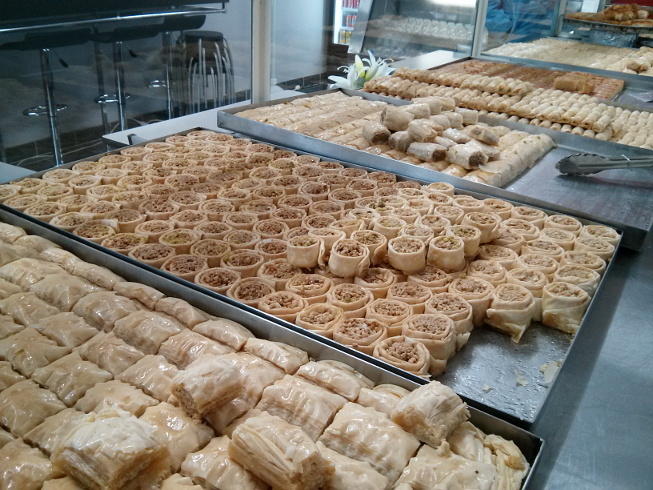 Cafe Sarabella is tucked away in the Victoria Street Mall, between Sydney Road and the Coburg Library. It’s a great little area out there with seating and recently lots of colourful yarn bomb installations. There’s a Middle Eastern shop there that sell nuts and stuff and I buy my pecans from there, but have not ventured a few doors down to Cafe Sarabella. I decided to check it out today as I was in the area. Buying pecans. Anyway, I’ve read some great reviews recently and heard word of mouth recommendations. 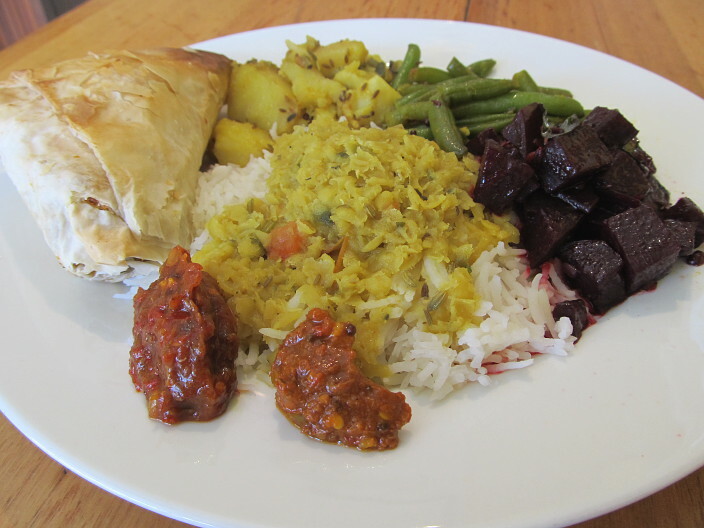 Okay so here I have her oven baked samosa in filo pastry, beetroot in spices and curry leaves, green beans with almond, potatoes with cumin seeds and other tasty spices, rice and lentils. On the side she put two generous dollops of really hot chutneys. Hotttt but delicious and you know why I mean generous dollop now. I took those home for Husband as they were too hot for me. This all cost $11 and I was stuffed. Next time I’ll have either the samosa or everything else as this was so much and Sara mercifully said she’d put less rice because I had the samosa. Of course I managed to stuff it all down in to my stomach. The food was delicious and Sara herself is an absolute delight. I was the only customer sitting down (it wasn’t lunch hour) and I ate my meal with Sara at the little table in the window (there are other small tables outside). Sara’s customers bring her fresh organic produce from their gardens and she in turn creates lovely meals and gives back. She gave me a little taste of her gingerbread almond cake (vegan!) and I was so tempted to buy a slice to take home but I thought I’d leave it for next time as I didn’t want it getting squished in my bag. 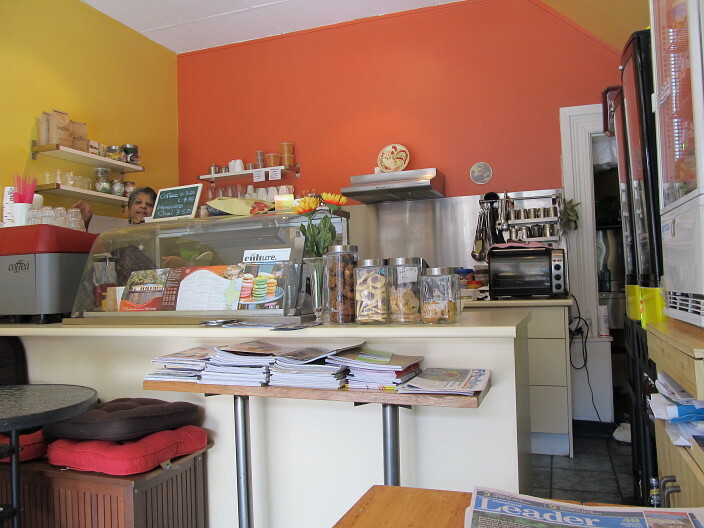 I”m always really happy to find not only a vegan place, but one which has exceptional customer service where the owners really care about their food and their customers. Going to Cafe Sarabella and chatting with Sara seemed like chatting to a friend you’ve known for ages. I forgot to take a photo of the outside, but here’s the view from my chair by the window. Hallo Sara!